The brown trout was recently voted the nation's favourite fish. Here fisheries technical officer Pete Turner talks about his work to help them thrive in Yorkshire. Eastburn Beck, like many tributaries of the River Aire, has its problems. Over the years it’s been straightened and widened causing it to become shallow, with a lack of varying habitat such as pools or riffles. Add to this a large number of weirs, the unmanaged woodland through which the beck flows and the signal crayfish and you’d be forgiven for thinking the beck was a lost cause. But there are trout populations in the beck, even though they have been confined to the small areas of good habitat or hiding in cracks of the walls which define the limits of the beck. 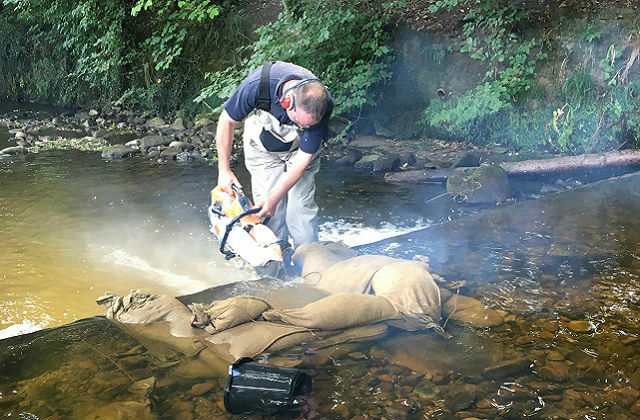 Well firstly, projects like this are always easier with friends so step forward the Wild Trout Trust and Yorkshire Wildlife Trust. Secondly add some support from the Aire River Trust, Forest of Bradford and the Woodland Trust. Lastly develop a plan of attack! The most significant issue here was the impact of the weirs so this is what we tackled first. 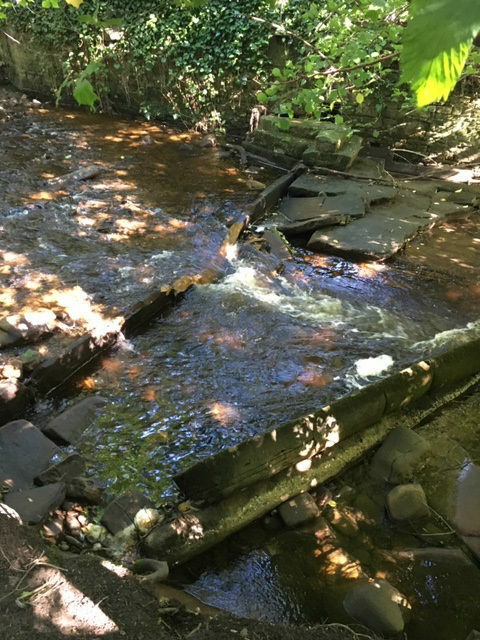 The weirs caused upstream ponding allowing fine sediment to drop out, covering the river bed and smothering the key habitats used by the trout and other fish. The weirs also prevented the natural transportation of gravel downstream ultimately depriving the River Aire, which Eastburn Beck flows into at Crosshills. The answer to the weirs was very simple and included a sledge hammer and an angle grinder! 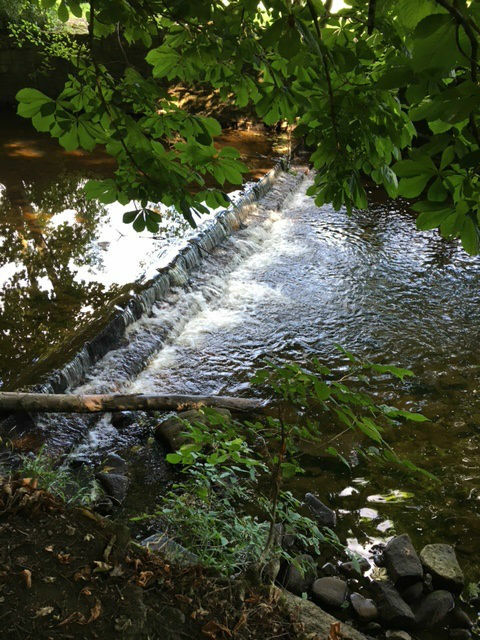 By cutting - or in some cases smashing - notches into the weirs, we created a focal point where the flows were targeted, scouring the fine sediment from the bed but also creating a deeper channel and in some cases, pools. Finally new habitat types were becoming a possibility in the beck. By offsetting these holes we hoped to create a channel which was no longer straight and boring but was wiggly and had some variations in water depth. Adding simple rock flow deflectors downstream of some of the weirs has added further interest by encouraging the beck to move further than it maybe wants to. So now some of the weirs have been sorted, has it made a difference? Three weeks after our initial work I visited the site and there are some interesting changes already taking place. The beck has clearly narrowed as the deeper, more sinuous channel starts to form. The bed has cleaned, with less sediment visible and I’m pleased to say that there were lots of trout rising to eat the bugs on the surface. Well this involves chainsaws and a bunch of volunteers to fell some of the trees within the wood next to the beck. We’ll be using these trees as large woody material, tying them into the banks of the beck and creating perfect hidey holes for the trout and other fish. We’ll also be using the stumps to repair the eroded banks where walkers have unwittingly created pathways into the beck for sediment which is washed out from the woodland when it rains. Felling some trees will have the added benefit of opening the canopy, allowing plants to grow again on the ground where they had been previously starved of light. The root systems of these plants will act as reinforcement to the soil, stopping it being carried into the beck. We’re not there yet but in the year that the brown trout was voted the Nation’s Favourite Fish we can feel happy that slowly but surely we’re helping to improve things for some of them at least. In a word, no. Hydro systems are the very antithesis of waterway improvement, and like so many alternative energy forms, barely worth the effort. Will be interesting to see the results after a winter of heavy rainfall. I don`t believe that the trout was voted the nations favourite fish by anglers, maybe it was by people that want them for food but never for course anglers. There are far more carp fishermen than there are trout anglers and if you did this vote again and let the carp people know that they could vote on it, you would certainly get a different result. I live in Wales and there have been many trout fisheries that are now devoted to carp fishing and that is because there are more customers for them. I also think that in Wales, there are very few rivers for course fishing and we are pretty much forced to fish on private carp fisheries, these places do not get a thing from the rod tax that we have to pay and as most of the money is spent on rivers, I find that very unfair, it is just a tax on fishing. Carp fishing is expensive, the tackle is expensive and we do not kill the fish that we catch so that we can eat them, we put them back unharmed. I think that if you only fish in private fisheries, a rod license should not be required unless the money was used to help the fisheries and then hopefully, the fisheries could then make our fishing a bit cheaper. I really do consider the rod license fee to be a tax on my hobby and that I receive nothing in return. @Chris Sinfield, are you for real? The nation had the chance to vote for their favourite fish, that included carp anglers so don't talk such clap trap. The licence fee covers may aspects of fishing and just because you don't use or benefit from them does not mean it is wrong. Don't be so selfish. Enjoy all types of fishing. Tight lines Mr Humbug. I fish rivers and lakes,and rivers need far more maintenance than lakes;it's good to see something being done.The river I fish changes in flow and depth almost every year,and it is a challenge to fish every time I go. Having read some of the ENVIRONMENTAL AGENCY .BLOG .GOV .UK on the introduction of " Shad " to the RIVER SEVEN . Is it possible to introduce this historical fish back into the other rIvers of the U.K. The “unlocking the Severn” project is unique opportunity as historic records show that shad in the UK were only ever present in the rivers of the Bristol Channel, River Tamar and the river Thames. This is because the UK lies on the northern range of the species. The population has sustained at a very low level on the Severn and is only blocked from recovery because of the few navigation weirs built in the 1840’s. Restoration of the Thames population is currently impossible because of the sheer number of weir, the changes these have had on the habitat of shad and historic poor water quality. Lessons learnt from the success of the “unlocking the Severn” project will be used throughout Europe to aid restoration of other endangered fish population. The project will be using volunteers to collect vital population data throughout the project and this is being organised by the Severn Rivers Trust. If the Severn is not your local river than opportunities for the restoration of fish populations and habitat is widely practiced on other river throughout the England and Wales, often organised by the local Rivers Trust. Nice article. Here in Australia we have quite different fish species with very different needs. Yet, man made barriers to fish movement are still one of the biggest challenges to healthy fish stocks. And similar projects to modify or remove small weirs have met with success here too. Inspiring!